Heads up: there’s 25% off almost EVERYTHING in my Society6 shop! I just found out about it. The deal ends Monday, April 8 at midnight. This includes art prints, t-shirts, phone cases, mugs, tote bags and loads of other things. They ship to almost anywhere. Go check it out! Today & tomorrow only: 25% OFF EVERYTHING in my Society6 shop (March 3-4). That includes tote bags, pouches, mugs, t-shirts, prints, phone cases and more! I love these deals. Pictured above or some of the items I’ve bought for myself over the years. (BTW this deal does not include yoga mats or furniture, which I haven’t created yet). My wife keeps me anchored; I would be seriously lost at sea without her. Speaking of loved ones, if you’re thinking this (or any of my other prints) could be a good Valentine’s gift, you better place your order ASAP so it can ship in time to get to you! A bird on a bicycle. LOADS OF DEALS on at my Society6 shop from now til Dec. 13. Today (Sunday) it’s $6 off “stocking stuffers”: Tote Bags, Pouches, Mugs, T-Shirts & more, AND 20% off phone cases, art prints and more. They’re having a different sale each day so just check the shop and see what’s going on. Yes indeed! Now through Friday, all prints in my shop are 25% off. Use coupon code PRINTSALE. Sale ends December 7, 2018, so get on it. Thanks for understanding, and for responding! I really appreciate it. I agree that it looks cleaner without my name, but I have to put it on there. If my work is put on the internet without my name on it, it will eventually be shared without credit, and no one will know who made it, and it has a better chance of getting ripped off. It’s very harmful to the artist. That’s why it’s important to never alter an artwork without the artist’s permission, and to always credit them in the post. It’s one of the best ways to support the art we love. The more people who understand this, the better it will be for all creative people! I love the word ‘fetching’. Hey, you can this drawing for just $40. It’s another one from my 40 dollar drawing series; I draw each one to order (just for you! ), and sign it. But don't wait too long! After Dec. 8 they'll be gone. Time for $40 DRAWINGS! Yup, you can get one of these drawings for just $40. These are NOT prints, they are actual original drawings, made by me. I call these 5 x 7 inch drawings 'multiple originals', because I will draw multiples of each. I'll make each one to order, and sign it. They’re all available in my shop. But don't wait! After December 8th, they'll be gone. I make a series of these every year, and this time it’s all about animals and rhymes. Just because. I love making these. It’s a great way to make original art accessible. Jumbo sized regrets. This silly dog is featured on the month of March page of my 2019 calendar. You can get your own calendar from my shop. I can ship anywhere! Seriously. The calendar is 8x11 inches, each month is printed on a separate sheet, all held together with a binding clip. Kind of like having 12 different prints (for just $25). “Reach as high as you can…” I put this one on the month of May page of my 2019 calendar, but it’s definitely applicable to any time, any month of the year. Order your own calendar from my shop. I can ship anywhere! It’s 8x11 inches, each month is printed on a separate sheet, all held together with a binding clip. Kind of like having 12 different prints (for just $25). We are all human, all the same species, all part of the same gigantic family. We are all more alike than we’d like to admit sometimes. By the way, I like your femurs! NEW 2019 CALENDARS ARE HERE! 3 of them! WALL CALENDAR: Like the last 2 years, I’ve put together an 8x11 inch wall calendar. Each month is printed on an individual sheet of cardstock, and the whole calendar is held together with a silver binding clip. Put the current month in the front, remove individual pages and use them as prints, or display them however you want. OMG so much freedom. BIG POSTER CALENDAR: For the first time I’ve created poster calendars! These are 16x20 inches, printed on archival, acid-free, durable matte paper. There are two to choose from, each featuring one of my all-time most popular images. I have LOVED putting together online classes lately, and I'm wondering what I should cover next! Is there something you'd like me to talk about, to learn about from me, that you'd sign up for? It could be ANYTHING. Let me know in the comments, or DM me your suggestions! Heads up: Society6 is having a big sale! 25% off everything when you use coupon code TAKE25. That's everything in my Society6 shop, including tees, tote bags, phone cases, mugs, and more. Sale ends Monday Aug. 6, so get on it! Did you know that this old favourite is available as a print? I'm super honoured that you're thinking of getting my art tattooed! I would like to ask you to consider purchasing a "tattoo ticket" from me. It's a way for you to support me, the artist behind the work. I support my family by making art for people to enjoy. When you get your tattoo done, you will pay the tattoo shop. It seems right that the artist behind the work should be paid a well. Also, some tattoo artists will insist that you get permission from the original creator of the art, so this is a simple way to provide that. Whether you purchase a tattoo ticket or not, I would love to see your tattoo when it's done. Send me a photo! Thank you so much for responding, and for taking my message seriously. And thank you for crediting my artwork on your post. It would have been better if it had been credited when it was first posted, when most of your followers saw it. But now is better than never, so thank you. I really appreciate that you plan on retroactively crediting all the artists whose work you've shared, and will ensure that it happens on all new posts going forward. It's the right thing to do, and it sets an example to others in your community. I realize that people share each other's work all the time on Instagram. And I appreciate that you tagged me, credited me, and told your audience to go check out my work. Thank you. But my name was removed from my drawing (either by you or by whoever you got it from), you altered my artwork by putting it on a foliage background, and you added your logo to the image. All three of these are inappropriate and disrespectful, for ALL artists, even if you do tag them. Adding your logo makes it look like YOU own the image, that it is YOUR creation. If someone shares what you posted, now your logo is attached to my work. You can repost other artists' creations, but can't alter the image, add a filter, crop out a signature, or any other alteration. It's disrespectful to the artist. Leave the work as is & credit the artist, or use your own creations. Otherwise you'll run into more trouble from other artists. Please delete the post with my artwork on it. "We are triangles". Watercolour & ink on paper. Seems like a pretty good combo. I made this one into some t-shirts, kids tees, tote bags, notebooks, and more. I feel like these speech bubbles hold some of the words that slowly guide me to a 'yes', to making a decision on something. I am horrible at making decisions, and the fellows in this painting represent a rare moment when the voices in my head have reached consensus. This one is acrylic on illustration board, 8 x 10 inches. Makes as much sense as the times we live in. Heads up: get 25% OFF EVERYTHING in my Society6 shop this weekend (ends Dec. 17 at midnight)! T-shirts, mugs, tote bags, phone cases, and more. 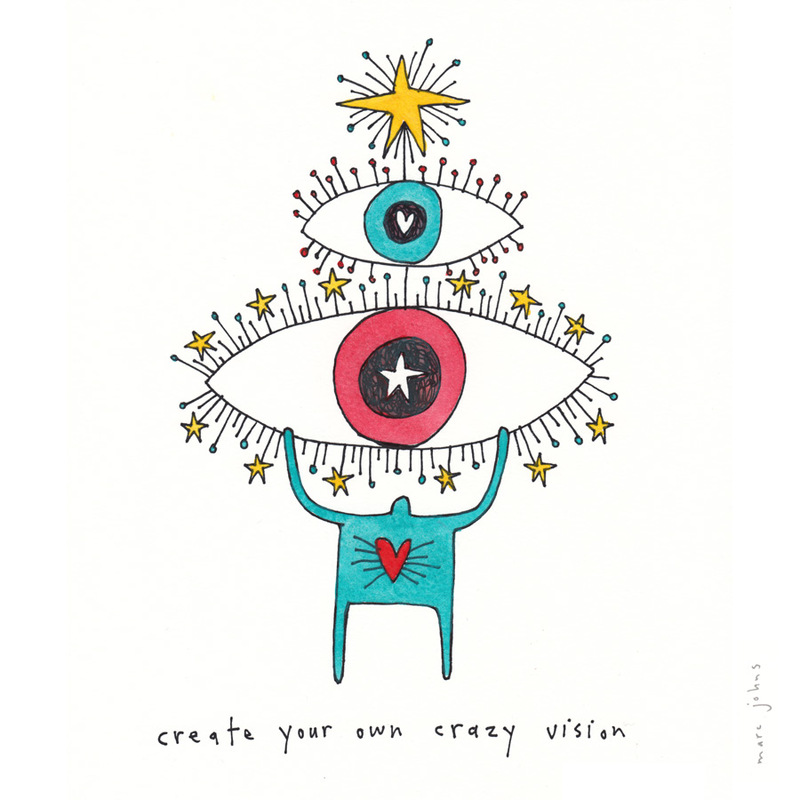 Create your own crazy vision. This is from my 2018 calendar. I've only got 19 of them left, so if you want one, order it soon! The Hovering Gentlemen's Club. They come together to rejoice in their ability to float ever so slightly above the ground. This piece of silliness is from waaay back. The good thing about all the grey November weather is more time indoors. Quite comforting. DRAWINGS FOR JUST $40. Yes, that's right. I will draw (and paint) any one of these drawings for you for $40. These are 5x7 inch 'multiple originals', meaning that I will draw multiples of each. I'll make each one to order, and sign it. But after December 8, that's it, no more. I LOVE making these. 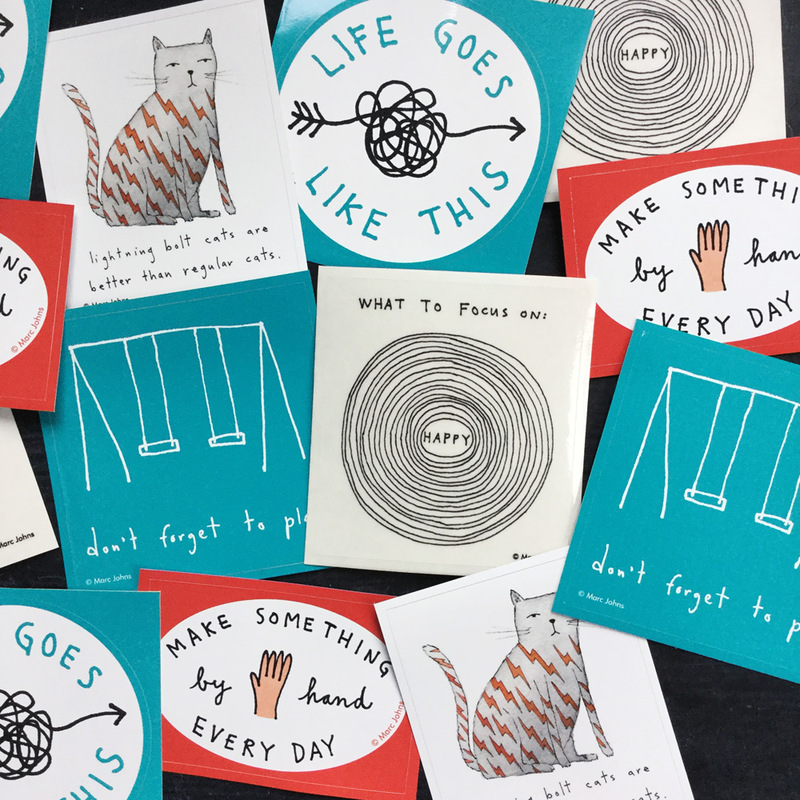 My hope is that it makes it easy to get a piece of original art into lots and lots of hands, maybe even your hands. I really just want owning original art to be accessible and fun. This is a page from my 2018 calendar, which you should get right NOW from my shop. Stickers! These are good ones: vinyl, water-resistant, perfect for putting on your laptop, phone case, notebook, tool box, whatever. I need a monster suit. It's all weekend long! Ends on Sunday May 8 at midnight. 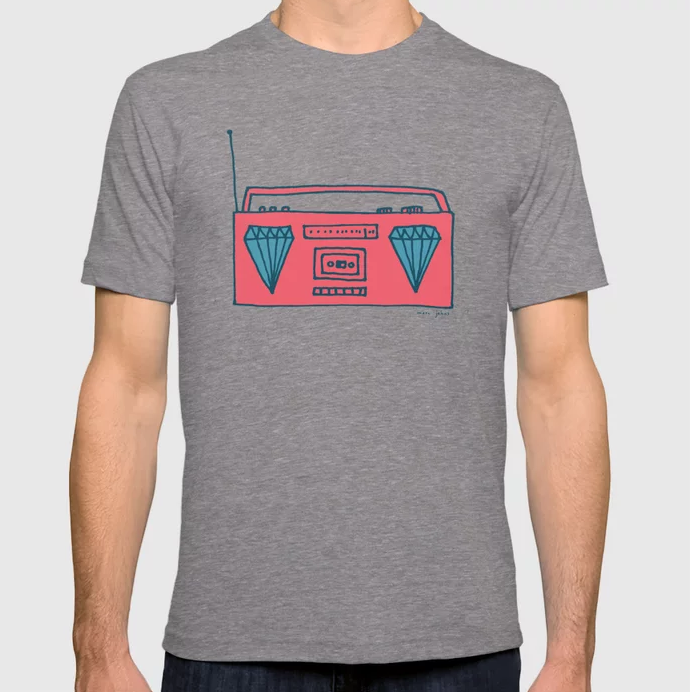 T-shirts, phone cases, mugs, tote bags, framed prints, phone cases, pillows, and more. All of it.